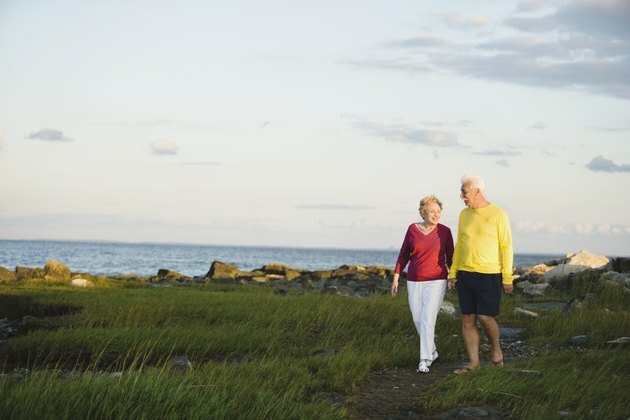 Walking can contribute to a healthy lifestyle for seniors. The best walking shoes for you, as an older adult, are those that fit your foot type, offer proper foot support, flexibility and cushioning, says the American Podiatric Medical Association. Your local running store can evaluate your walking pattern and properly fit you for the right shoe for your foot type. The three common foot types are over-pronator, neutral and under-pronator. Over-pronators typically have a flat arch with an ankle that rolls as they walk. Your shoes will wear on the inside of the sole. Motion control shoes are best for walkers who over-pronate. They are the most rigid shoes and are designed to reduce over-pronation. Those with a neutral stride usually have a normal arch with a heel that maintains vertical position during walking. Your shoes will wear at the first and second toes. Stability shoes supply ample support and durability for neutral walkers, offering a mid-thickness heel. Those who under-pronate normally have an ankle that rolls out during walking. Your shoes will wear on the outside of the sole. Cushioned shoes are best for walkers under-pronators. Cushioned shoes have thicker heels and are flexible with the softest midsoles and the least support. American Podiatric Medical Association: Balance-Boosting Footwear Tips for Older People. REI: Running Shoes: How to Choose. REI: Walking Shoes: How to Choose.